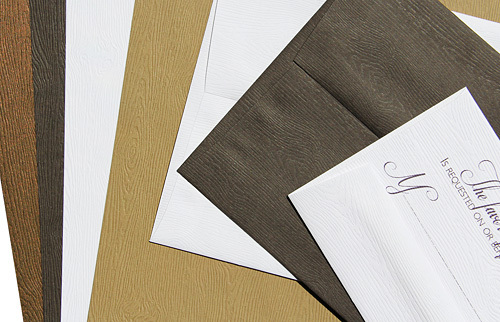 From our fantastically textured wood grain paper family comes wood grain pocket invitations, cards & wraps! Perhaps we're partial, but we think they're pretty awesome, and we think you'll agree. Simple and streamlined our wood grain pockets are true luxury! Order samples and check them out. Wood Grain Pocket Cards, Imagine That! It goes without saying that the highlight of these pocket cards is by far their deeply embossed, incredibly lifelike wood grain texture. Capturing all the knots, grooves, and characteristics of real wood, the texture on these cards is a must see and a must touch! 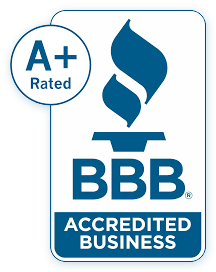 Note: These pocket cards are made from paper that is heavily embossed on one side. The wood texture is most pronounced on the front of the pocket and on the side of the card opposite the pocket. Choose from a neutral yet rich color palette ranging from bright white to deep chocolate brown. This neutral earthy color palette not only complements the wood grain texture perfectly, but also the color scheme of just about any design you can dream up! 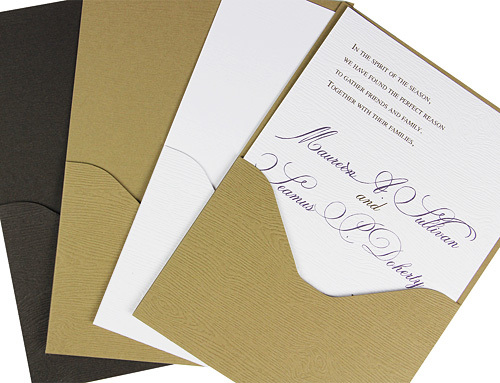 To pair with your pocket card invitation design, we offer matching wood grain envelopes, papers, and pre-cut cards in a slew of sizes. Use the Pocket for Your Invitation Card. . .
Pocket cards can be used in two ways. 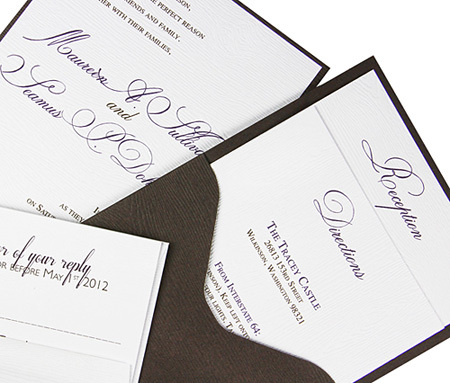 You may choose to use the pocket to hold your invitation card, using it almost like a backer card. For a more layered look, you may use the pocket instead for all the extra "stuff" that goes into an invitation ensemble - direction, reception, response items - just stack them all up in the pocket, and stick the invitation to the back. Your invitation, your choice! Both ways look very chic, and very cool.